Today, Victoria and I want to share with you a real life email sequence we shared with Deb, as she used Neville Goddard’s methods to solve a problem she had. …and just over a year ago invested in the Candid Creation Recordings and the Neville Goddard Prosperity Pack. Notice how it took just a little nudge from us, to help her help herself and to change her world. Let’s dive in. Don’t know. There are MANY ways to approach it. My personal, would be Remembering When it was a big deal, and now feeling as if it’s not. Good on you for being here. A SUCCESS STORY. I Remembered When this speeding ticket was a big deal, I ran this over and over and then this morning I just dropped it, (I knew it was done.). A client of mine was upset that I couldn’t make lunch with her family Monday. I explained that I had to work because of a $196.00 speeding ticket. She paid me for my service (hairdresser) and ran out of the salon. Tonight I was tallying my money, and she included a $200.00 tip! Felt it real!!! TT and V note: So we wrote Deb back…. Please do TT and V. So I’ve been Feeling Real for a long while, only when I remembered, maybe once a day, I’d skip a day or two, not receiving quick enough so on the back burner it went. Since I first wrote you about WWND, I did my sessions several times a day. Whenever I would feel bad, or angry about the ordeal, even for a few seconds, I’d have the imaginal conversation with a friend, that I recalled when this was a big deal to me, and we’d laugh about it! I had the reminders, so that was very helpful. Please edit this testimonial as you feel fit. It’s 5am here, time for me to work on my future. Thanks for taking an interest in our lives, give Emmet a belly rub for me, and Love to you all! The Mistake Most People Make: Not being a doer. Notice that even after investing the packages, and being on the daily email list, Deb didn’t do her sessions every day, she slacked off on them when things weren’t coming as fast as she had hoped for. Many people do that, because on your own, for many people, building in the new habit of Feeling It Real no matter what – is a challenge. One that can be overcome with just a bit of guidance and encouragement. Today’s Take Away: DEB THEN DOVE IN AND DOVE DEEPER! Action Amp Up: MAKE THIS your way of LIFE! We hope you join us in Manifesting Mastery Deb, so you can take your results even higher. Most people in the program email us a quick email once a week or so, for guidance and to let us know about their Success Stories. … takes you from where you were with manifesting before (slowing down when discouraged) and and gives you TANGIBLE EXPERIENCES so you get RESULTS in all areas of life. Congratulations Deb for your success, now it’s time to take to the max. 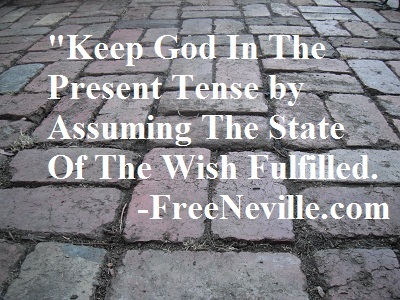 3 Comments on "What Would Neville Do – Neville Goddard Success Story"
It’s true!! As a Neville newbie needing to get out of quite a few negative habits I am applying ‘remember when’ several times a day and it definitely works a treat! So simple. I did it only last night when out of the blue I was copied in to an email from one of our, shall we say, more ‘demanding’ clients in which he was berating my bookkeeper for missing his VAT sales tax return and causing a penalty notice. Now I immediately turned on worry mode and lack of faith in my bookkeeper mode and general “OMG this is going to impact on me and mess up my lovely day” mode! Then after calming down (about five minutes!) I did a swift ‘I remember when this sort of ‘contrast’ in my life would really get to me”… ok that didn’t feel real and was just saying the words so… try again this time smiling at how pleased I am this doesn’t bother me any more.. ‘I remember when this sort of thing REALLY got to me’… and as I accentuated the ‘really’I felt it so real I actually laughed out loud with the relief that ‘this sort of thing REALLY doesn’t bother me any more’!